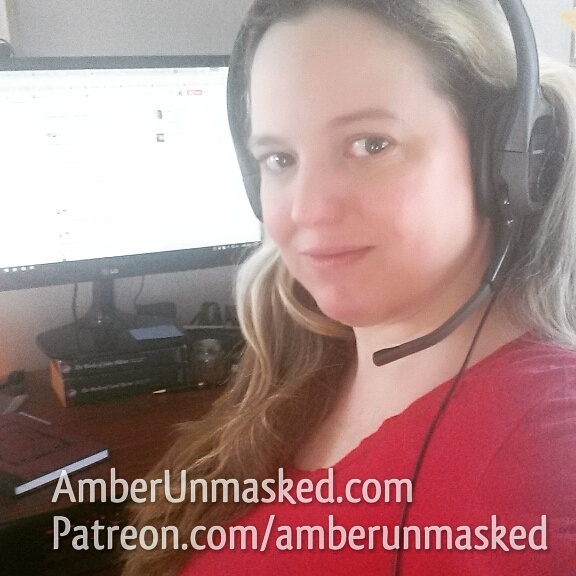 AMBER LOVE 08-JUNE-2017 My work is supported by the generous backers who tolerate my cat stories at Patreon.com/amberunmasked and they also get first access to what’s happening with my books and podcast. 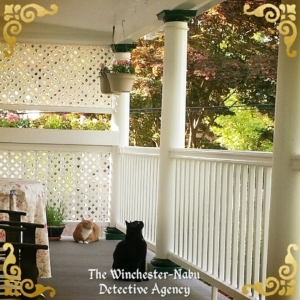 In our previous chapter, Detective Inspector Guster Nabu allegedly hunted and killed a large mouse inside the house. I have to say allegedly here because he does steal things when he sees Professor Oliver Winchester having fun with something. SUNRISE. SECOND FLOOR VERANDA OVERLOOKING THE BACK OF THE WINCHESTER-NABU ESTATE. 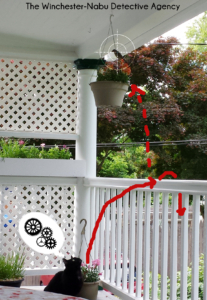 Since the reconstruction of the veranda, the columns were changed which eliminated the space at the top of them where house finches would nest. This year, the birds got creative. 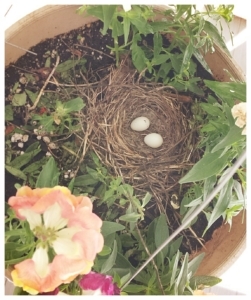 Hanging baskets of snapdragons were high from the floor and the finch family decided to build their nest in one of them. 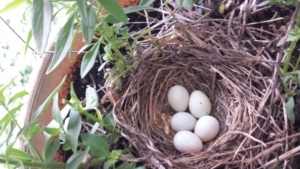 At first, Momma Finch laid only two eggs. 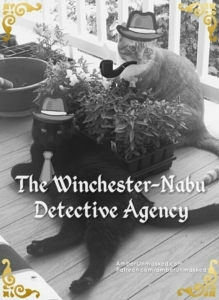 Detective Inspector Guster Nabu didn’t know what to make of them, but they smelled intriguing and mysterious. He waited to investigate further. Days later, more eggs appeared. The finches became much more territorial. They began flying through the porch to count the number of possible predators. One. Two. Sometimes three or four if humans were to be counted. The black predator (Gus) was often as still as a statue with his eyes focused like deadly sites on the hanging basket. The fatter orange one (Oliver) often tried to engage in conversation with the finch family to reach a negotiation. Perhaps he wanted one of the eggs in exchange for rent. 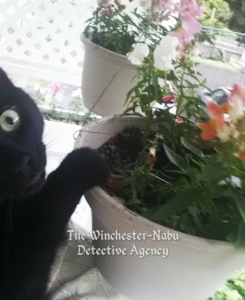 Detective Inspector Nabu is not known for his agility. He shows some skill in speed with a bit of dexterity, but he’s far from graceful. Not a great athlete. He often thinks of elaborate plans which don’t work out to his benefit (like escaping or jumping onto the roof). For months, he’s been trying to figure out how to get up on the railings and walk across them. The humans have managed to stop him each time he has “that look.” Today, however, Gus felt he was ready to leap without hopping onto a chair first. He had some pre-porchtime cardio and believed he was limbered up. Limber still doesn’t mean smart nor graceful. 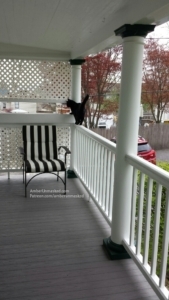 Gus landed on the plastic composite railing and found that he couldn’t dig his claws into it like the previous railing made of wood. He slipped and began going over the railing, hanging on for dear life. As his human, I put down my phone and ran to scoop him up. He didn’t even seem appreciative. I let him sniff the basket one more time showing him neither of the adult birds were present. Then he was put inside for desk duty to which he complained loudly and often. Gus would like you to know it’s National Best Friend’s Day. 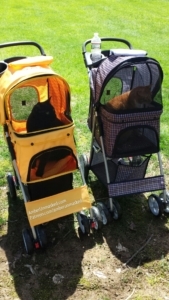 He and Oliver have been out on buggy rides already (separate vehicles of course). Gus would like you to consider adding a new friend to your home by visiting PetFinder or going over to the Franklin Township Animal Shelter in New Jersey from where he was adopted.